© 2015 MCP Interactive. All Rights reserved. (1) Entry Door for easy access and cleaning. (2) Siding: 50-year warranted Smart Side in choice of color. (3) Roof: Lifetime warranted shingles. (4) 10” Overhang to protect open windows from rain. (5) Lots of Windows for light and ventilation. (6) Nesting Boxes: Shingle roof with flashing to eliminate leaks and rotting. (7) Egg Collection Doors Spring-loaded hinges, gather eggs from outside with ease. Allows your chickens to get out in the open air. Provides protection from hawks and other predators. Provides shade on hot summer days. (9) Sturdy pressure-treated 4×4 Construction. 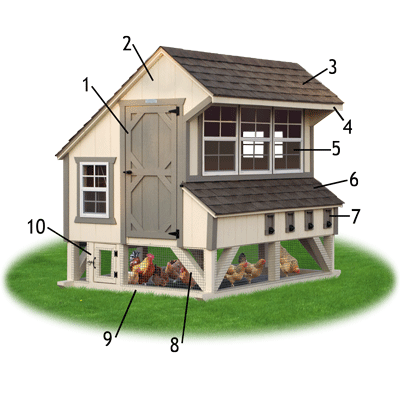 (10) Easy Turn-Out Door allows your chickens to range freely. Built-in Roosts for your chickens’ comfort. Built-in Ramp drops down to allow chickens access from the upper coop to the open bottom area. (Ramp is on hinges and closes by simply pulling a string). Wheels are available for easy moving on your property.